As almost all the girls do at some point in their lives I started writing a diary. Not only once, but several times. Back then it was about life in general, mostly about anxiety of a young girl and about boys of course. 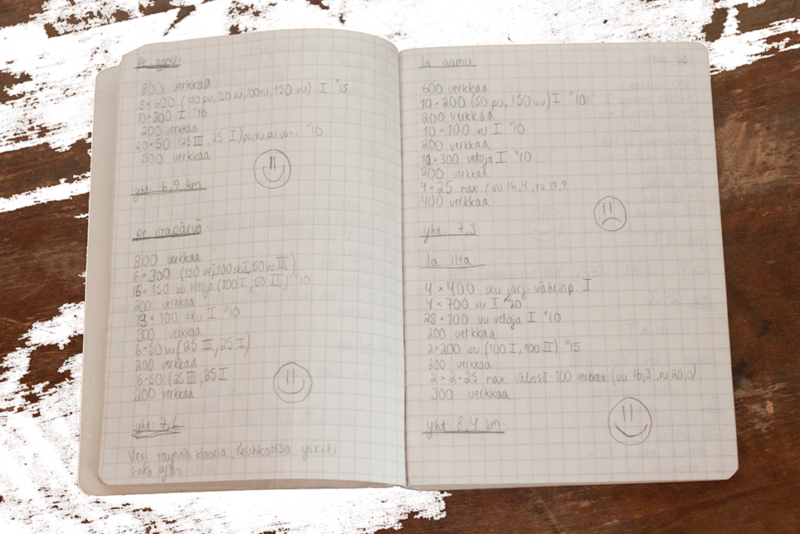 However, quite soon when my training got a bit more serious I started keeping a training diary as well. At first in 1994 it was just a notebook / block. I wrote down the training sets, times and how the set had gone. I wrote also about my feelings or at least draw smileys. In 1998 when I started with triathlon I started using a more advanced form. The form had a table where I wrote down each discipline, not only the distance and duration, but also the intensity levels as well. 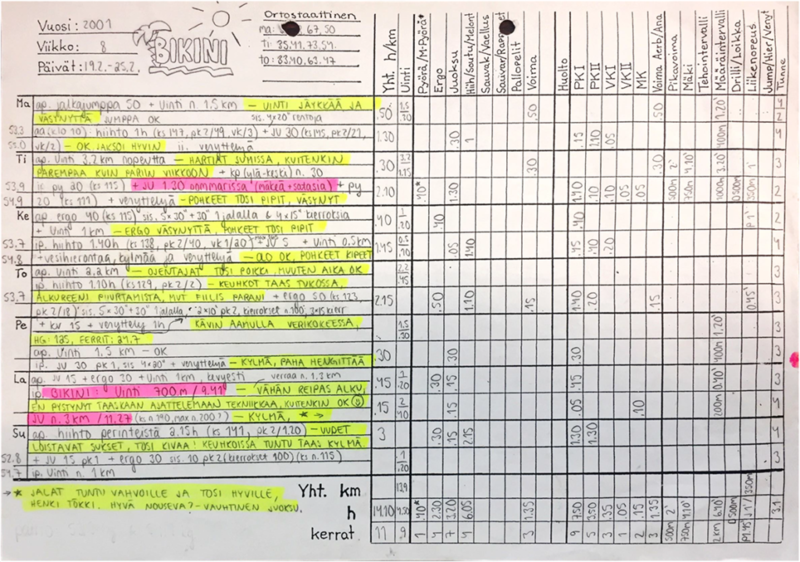 I used yellow marker for comments and pink marker for pointing out the most important sets of the week. On the flipside of the paper I wrote down each session individually, i.e. swim sets, speed, heart rate, feelings, etc. I continued with the paper forms until 2013 when I started using a spreadsheet based form on a cloud. I thought that it was already quite advanced, but was also a bit sad since I could not anymore draw flowers or sun to the edges of the paper sheets . I did not either want to use automatic uploads for the data or some application instead of the spreadsheets, since going through the data and the sessions manually i.e. inputing numbers by hand and calculating the means, etc., was developing me not only as an athlete, but also my coaching skills for the future. However, in 2016 I started using a web based solution for tracking, analysing and planning my training, but most important was the communication with my coach on the other continent. Quite different than how it was before, “He would come to the race office to pick up the fax of his training schedule from his coach back home in Finland, and then that would determine what he could do around the race.” The quiet achiever: Pauli Kiuru – “Triathlonisti”. Transformation of my ‘physical’ training diary represents perhaps the way this has gone in other areas of everyday life as well. Integration of digital technologies into everyday life by the digitisation of everything that can be digitized. (I asked Google – What is digitalisation?) It has not been always so easy to adapt the new technologies and we are not so eager to change our way of working. Is keeping the training diary important? The challenge for the high performance athletes and coaches is how to harness all the technological possibilities so that these serve a purpose and provide means that can in best case be converted into competitive advance, those so famous marginal gains. The technology itself does not provide any solutions or answers if we cannot implement them into the way of working a.k.a. the process. The provided insights should lead us to make changes. 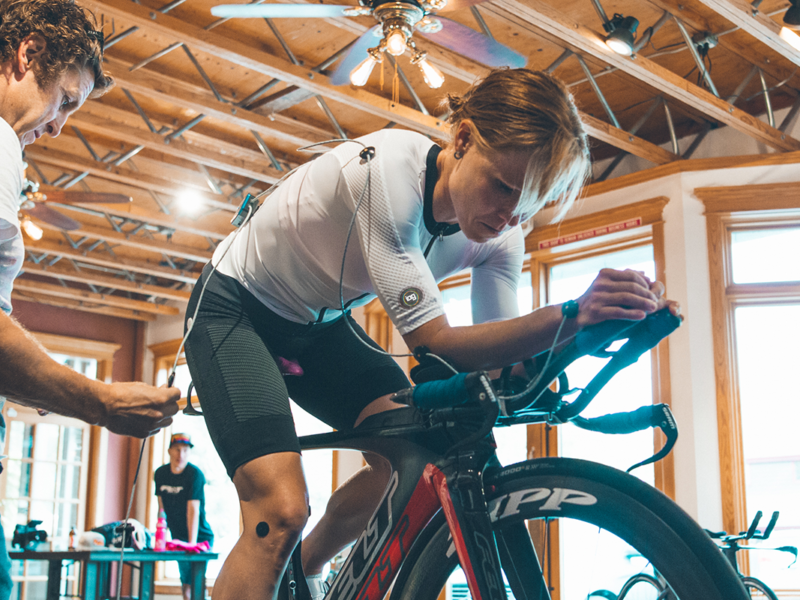 Of course it is great to have beautiful graphs of your heart rate or see how your cycling power developed during a race or a training set, but more important is how does this information influence on our planned actions. Back in the days I reviewed and analysed my training when I was filling the sheets manually by hand. Then my coach got the copies from me and had his own way of working with them. Then we had our weekly discussions about my training and made plans for the coming weeks based on our reflections. Now that I am using the more advanced solution for logging and sharing of my training data with my coach, the rest in the process is more or less the same. I update the workout log file, review and analyse the training session similarly as I did in the past (I do let the solution do the calculations) and then we discuss with my coach how the session went and how I felt. The only thing that has changed is the means for reporting and communicating, the process is more or less the same; plan, execute, follow up, analyse (& re-plan), repeat. The importance of keeping the records is defined by how this adds value to your daily activities. If you compare this to any development project or creation process, if you wish, with the accurate information we can trace back the point in time where we did or did not do something. Then we have the option to make changes that are required for improvement. We cannot change the past, but we can always learn and improve. On those pages, forms and spreadsheets is my whole story, how I got here, and what ever happens I can always go back to my records and remember.